If you are afraid your taste for chocolate will make you gain weight or cause bad side-effects, like damaging your teeth or adding way too much sugar to your diet, use these quick and easy steps to stop chocolate addiction for life now. They will work for chocolate cravings during pregnancy, menstruation, PMS or any stressful event, regardless of how many times you’ve succumbed to your chocolate munchies in the past. Chocolate contains a lot of magnesium. I have noticed that most of the time, my chocolate cravings vanish when I take magnesium daily. Among all chocolate cravings causes, my biggest trigger is menstruation. My cravings usually vanish after one or two glasses of magnesium chloride water. I make it with 22g of Nigari per liter of water or 0.8 oz per quart. When in a rush, I just drop one coffee spoon in a large glass of water. I find that magnesium releases stress, improves my sleep and reduces my chocolate cravings. I take one glass at night. Two is OK, but no more, because magnesium chloride has laxative effects. I sometimes eat too much chocolate because I haven’t had enough to eat. I think it’s more a case of hunger than a craving, but still, it’s not a healthy way to eat. In other words, eat and drink enough so that you’re not tempted to use chocolate to suppress your hunger. Drink water in between meals and eat fiber-rich fresh food, like fresh vegetables, and take the time to chew your food. That will send your brain signals that you’ve had enough to eat. You’ll find it’s much harder to binge on 86% or more dark chocolate than on milk chocolate. I find it almost impossible. Try very dark organic chocolate to get what your body needs. You’ll probably eat only 3 or 4 small squares and won’t be filling your body with unnecessary sugar and additives. If that’s not enough, try the next technique. This technique is very powerful and simple to use. I share it only with my newsletter subscribers, but it’s entirely free. Click here to discover how to stop any chocolate cravings in 8-12 minutes or even less. I give access to this secret craving busting technique as a welcome gift to all of my subscribers. If you suffer from emotional eating, your attraction to chocolate may be due to a mental association rather than some hormonal imbalance or anything physical. It’s the expectation of what chocolate can do for you – like comfort you, make you feel loved or understood – that makes you crave chocolate. If you suffer from emotional eating, first you need to learn the three basic skill you must master to stop emotional eating. The most important step is to learn to identify the thoughts and emotions that trigger your cravings. Now you know what you’re trying to get out of chocolate, you must discover how to meet your emotional needs without food. I teach you how to do that in my article about overcoming food addiction. The same general rules apply to chocolate addiction. Like with every addiction, you may be somewhat afraid or worried about how you will cope without chocolate. Eliminating addiction takes courage, but it is a very empowering and liberating experience that opens the door to a happier and more fulfilling life. Right now, you may feel that chocolate is all you’ve got, and that may be true. I know I have used food to tolerate the unacceptable in a very toxic relationship. Ending my addiction also meant facing other aspects of my life. Ones I didn’t want to face. I’m sure, as you’re still reading, that you probably have enough courage to deal with that aspect of change. Beliefs like “I’ll feel deprived” or “I know I can’t let go of chocolate” are the main causes of major relapses and failures. That’s why, to succeed, you must address these as well, or your success will be only temporary. To fully break-free, read the part where I teach you how to change beliefs on my article about goal setting. I hope you’ve enjoyed this article. 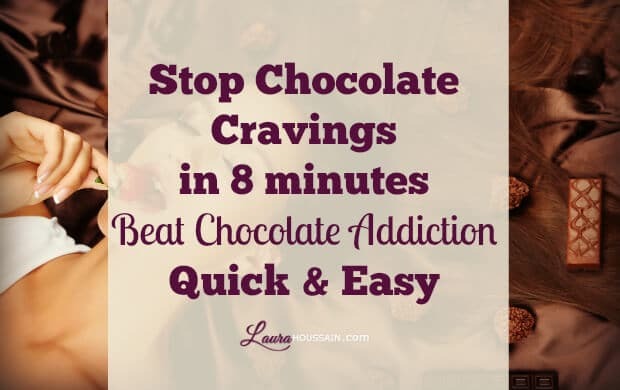 Let me know what you think by adding a comment below and if you haven’t done so, click here subscribe to my newsletter and discover how to stop any chocolate cravings in 8 to 12 minutes. Please help me kick chocolate. I say I am buying it for my grandchildren but it is really for me. I have to eat it every night. It’s hard to realize that you are lying to yourself just to eat in secret. But this moment of truth is necessary to break free from chocolate addiction. So, congratulations on being honest about it. until… she stopped in just 5 days! If you want my personal help, please contact me here and let me know how you want me to help you. Join my free community if you want to get group support. help me ditch chocolate please ! Please contact me here and let me know how you want me to help you. I’m turning 70 soon and have never been addictied to chocolate until now! I’ve always had slabs in my cupboard and ate it occasionally. I will try more magnesium as suggested by you. I’ve had heart and gut problems for a while and think that I’ve almost cured the gut problem but there must be an imbalance somewhere that I suddenly have this craving. I find that hormonal imbalance can also increase chocolate cravings. But magnesium often helps at least a bit. But what changed my life is the craving relief technique I share if you subscribe at the top of this page. It has helped me easily relieve my PMS related cravings. I would like to learn more about curbing my chocolate addiction. it is my drug of choice, because of how good I feel when I am eating it. I have a lot more self control with other sweet things, yet I will secretly go and buy slabs of chocolate and eat it secretly in my car. I hope you can help, because I’ve tried substitution, eating darker chocolates, not keeping a stash and magnesium supplements. You may try them. But I find they are unnecessary to get relief in all cases. But I’d have to speak to you to be sure. Realizing chocolate is the highlight of my day and a reward…feel like I’ll def feel deprived without it… what to do??? What I find is that as long as you think that chocolate is your favorite “reward treat”, you won’t give it up. You can pause for a while but not give it up entirely. And, this is what you seem to be experiencing. Hint: if you want to let go of wanting chocolate this way, you need to change your perception of it and how you reward yourself. I’m working on an email series that explains all this. You’re going to love it. I’ll send you a quick email when it’s out. I’m 12 years old, And I’m addicted to chocolate. I eat like 2 bars a day. I know, it’s terrible. I don’t have control. How can I refrain myself? I want to eat healthy. Thank you for reaching out to me. I wish there was one simple sentence that could help you solve this chocolate addiction problem. But I have found that everybody is unique and are addicted for different reasons. What I suggest you do is you try the videos I share with the people who subscribe to my updates in the header. You can write to me if you can’t find it. Just use my contact form to do so and I’ll share the link with you. It’s a technique that has helped me dominate my own chocolate addiction. I think it’s also important you ask support from your parents and/or your grandparents or other adults around you if your parents are not supportive. At such a young age, you need all the support you can get. I know it may not be easy to say. But it’s all worth it because keeping this to yourself isolates you and make things worse. I firmly believe these chocolates have some kind of addictives… it’s not normal to eat chocolate every single day. I don’t get stress easily neither do I eat chocolate to fill some kind of hole lol. I eat it because it taste tooooooo good. Today is day 1 of avoiding it. I actually had lots of kit kat yesterday, the day before and for the past 3 weeks every day (im talking about the king bar they sell at walmart)…i left a bit yesterday and I have it on my living room table, I look at it, and I’m basically talking to it hahaha saying today, if I make today tomorrow I will also make it. I actually got disturb by when I actually put it in my mouth, about to eat it, and I got angry at the fact of surrendering so easily, I didnt even bite it…so for now I’m good. I got 5 more hours of this torture, even quitting cigarettes was easier than this. Thank you so much for sharing this Liz. I have a few questions for you. How much longer do you think you can resist chocolate you seem to love so much? You say: “I eat it because it taste tooooooo good.” Will you feel deprived without this too-good taste? What do you think? And, what will happen if you just can’t handle so much deprivation? Let me know. And, if that doesn’t work out the way you hoped, maybe you want to try a new approach. I’ve got one for you. Chocolate can be addictive. I used to looooooove it that way along with sugar. But I don’t anymore. Chocolate is still addictive. But I have changed. And, I have helped several women do the same. I know it is achievable. I need help with my chocolate addiction. Even if i say to myself I’ll eat something sweet like fruit or youghart etc instead i always end up buying a block of chocolate and consuming it very quickly. It’s such a terrible habit & i feel like it’s ruining my life because i’ve gained so much weight! i can’t just have a small bit also. I need to cut it out completely. I definitely feel like i use it to calm my nerves if i’m stressed which is daily. I’m starting to meditate everyday to help with stress but still find those cravings later in the day. Thank you for sharing that with me. I know that meditation is probably not enough though helpful. I have found that you need to use several tools and skills all at once and long enough to come to terms with a chocolate addiction. It’s beyond what I can share in a comment. But, I do hope you will start putting to use tips I have shared in this post. Help me! Straight after dinner I will find myself eating chocolate, be it chips out of the cake decorating pot or cooking chocolate in major chunks. I just can’t stop eating it. I’ve even found myself putting chunks of Cadbury’s on my cereal, for goodness sake! I just can’t stop! HELP ME!!! I have sent you a private e-mail. I am happy you have found my site. You have come to the right place. I am sat here reading this article whilst eating malteasers ?? That’s OK Hayley. It just means you need to put my tips into practice and use a little bit of patience. You can let go of chocolate addiction. That’s a given for me even if you probably doubt it. Unfortunately, my blog post doesn’t have the magic powers to make that happen while you reading it. But you can do it. I have shared another strategy here that has helped one of my clients recover from chocolate addiction in less than a week. I think you will like it.It’s worth giving it a try so read and hop on the challenge at the end of that post if you resonate with what you’re reading. Oh God maltesers are my weakness. I’ve also discovered the milk chocolate from Aldi which is sooo delicious. i am madly stupidly inlove with chocolate, i can not quit. You cannot quit or do not want to quit or both, Mo? Often my clients believe they can’t live without the food they ‘love’. But once they accept to look at what’s truly missing in their lives, they often admit that no food can ever replace it. And when they start replacing food with more self-supportive strategies, food gradually lose its appeal. And as you have read this article all the way to the end, I suspect that it’s not chocolate you truly crave either. Well if you’ve read this article Mo, it means you probably have some desire to quit. And as you have used the word “quit” you are probably aware that it’s not love but rather an addiction. You can “love” chocolate and eat it in moderate amounts. If you can’t, then you are probably addicted to chocolate.